You're About to be Redirected to the New Home of Ground Control to Major Mom: Florida Discoveries 9: Akers of Strawberries! 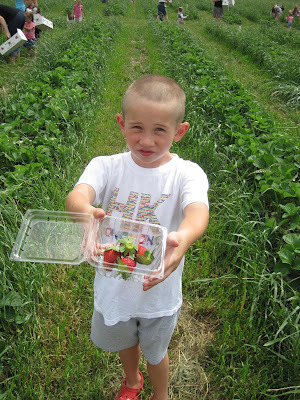 Florida Discoveries 9: Akers of Strawberries! Love that name! It's the name of our nearby you-pick strawberry farm. 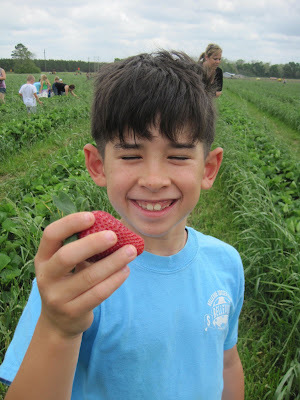 This post will be about our strawberry picking experience, which wasn't quite as nice as The Vollmer Farm in North Carolina, but it has the Bellevue Berry Farm in Nebraska beat, hands down! My next post will cover the strawberry jam I made out of about 3/4 of the berries we got! If you're east of the Mississippi, chances are you've had a chance to enjoy some Florida strawberries. 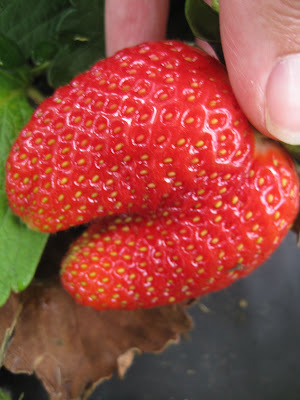 Plant City, Florida is the "winter strawberry capital of the United States", shipping about 3/4 of the nation's berries throughout the country in the midwinter months. Right about now the Florida harvest is wrapping up and folks are getting less Florida berries and more California berries. I personally think there's a HUGE difference! Florida berries are bigger, redder and tastier! I can't believe how beautiful these are! Sorry, no smell-o-blog. One of the neighborhood moms put out a Facebook invitation over the weekend to meet at the local Publix parking lot, and then car pool up to the berry farm. Akers of Strawberries is about 40 minutes northeast of Navarre, and it was a fun trip. I took a couple of the older kids in my truck along with Jacob and Timmy, and they enjoyed watching Return of the Jedi on the ride. The berries were so big, you couldn't fit that many into the pint-sized container. This wasn't as great a deal as it sounded. At $1.50 per pound, and $2 for the frozen yogurt, this was more like $3.50 worth of product for $5. Many of us put down the money without realizing what we were getting into. Oh well, the kids were happy and that's what counted, right? So...we picked out about 9-10 lbs. of berries total. Jacob and Timmy, despite not really liking strawberries unless it's in Go-Gurt form, really enjoy looking for that perfect berry. I was attempting to recapture a picture I took of the boys in 2007 in North Carolina. Good thing I was wearing a red t-shirt! ...you were left with this gaping hole that seemed like it would be a breeding ground for mold, bugs and other yuckies. Jacob couldn't help but laugh at the "funny berries"
We filled up the two small microscopic containers and part of a cardboard flat with some HUGE berries, enjoyed our picnic lunch we brought, and then had the frozen yogurt. I had mine on top of a strawberry shortcake (homemade shortcake) and it was one of the best I'd ever had. I'm sorry I didn't take a picture of it. Here's our stash of berries, about 1/3 of which were made into jam 6 hours later! But that's for another post! We're hopefully going this week!! Reminds me of when I lived in Tampa one of my co-workers would drive to a relative's strawberry farm and load up a pick up truck of flats. We'd have look outs stationed at the windows so we could get a jump on the stampede that happen when they drove up. 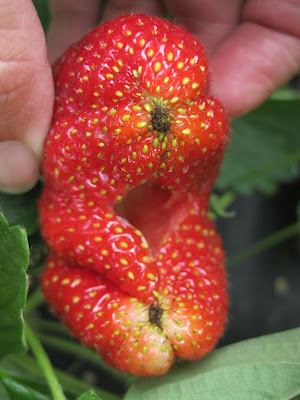 Those were the best strawberries!